Additive colors are created by the mixing of visible light that has been emitted from different color light sources. 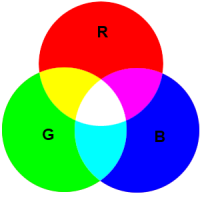 Red, Green and Blue (RGB)are mixed to produce different colors. Both computer monitors and televisions us additive color to represent images on their screens. RGB colors can only represent approximately 70% of visible colors. Because of the difference between additive and subtractive color (see below) it is difficult to tell what an item on the computer screen will actually look like in print because of the compressed color gamut used in printing. A typographical measurement unit equal to 5 1/2 points. Agate may also refer to type of the size of 5 1/2 points. It can be set a approximately 13 lines to the inch. This is the smallest readable font size for newsprint and is often used for statistical information or legal notices. In England it has the appellation of ruby. On web presses, the paper must be turned to allow for printing on the front and back. This is accomplished by the use of the turn bar. After the back has been printed paper is rotated on the press by running it through the turn bar. It is usually located just after the the last back print station. Oil-based solvent (quick drying) used in the preparation process of dyes and inks. Can be used in security inks to bleed color into the paper resulting in a visible indication that the document is an original. Any part of a lower case letter which rises above the X-height of the font, such as "f", "l" and "h". Adhesive which is applied to the back seams of an envelope to join them together. This may also be called seam gum. Printing on the reverse side of a form or sheet of paper. On business forms this area is typically printed in a screened color (50% or less) or in light gray (e.g. PMS 423 Gray) in order to prevent the back image from showing through (bleeding) on the front. Thicker stocks and coated papers printing may be printed without screening. Business form backers are typically either head to head or tumble style. A tumble style backer is printed head down on the page. When the page is tumbled over, it is then in a readable position. Packaging of forms or envelopes by the placement of a paper band around a counted number of items. This is especially useful for items that are distributed in a set number to various individuals or locations. Envelope that is primarily used for formal announcements and greetings. 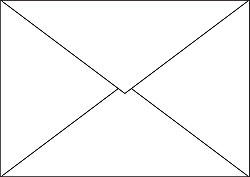 This type of envelope has a large pointed flap and diagonal seams. 24 Pound Bond - 17" x 22"
Writing Papers - 17" x 22"
Cover Weights - 20" x 26"
A design school in Germany where the Sans Serif font was originated. The school believed that "less is more" and that "form should follow function". The Bauhaus believed that beautiful and functional objects could be produced through the use of industrial processes. This of course stood in direct opposition to the Arts and Crafts movement. The department in a print shop that specializes in finishing the printed product. Their operations may include cutting, binding, folding, and drilling of the printed product. Extra ink area that crosses trim line, used to allow for variations that occur when the reproduction is trimmed or die-cut. A typical bleed amount would be 1/8" or 1/4" on each side of the artwork when it is printed. This area is often required for the printing process to prevent extra trimming of the item being printed. Note that bleed is a specific amount of area. Am area of print that is slightly larger that the image is not considered a bleed. Also see "crop marks" entry for further illustration. A pattern that is printed to obscure the transfer of information on an area of a business form. This is often used to cover up information such as price, credit card number, or any other information that is not needed by the party receiving that copy of the form. Any type that has a heavier black stroke that makes it more conspicuous. The image above shows 3 different weights of the typeface Myriad Pro. A grade of strong, durable writing and printing paper that has a standard size of 17x22 inches. This is the primary type of paper used for business documents, letterhead, copies, and most basic printed documents. 1. A registration problem, usually on copiers, where the image appears to bounce back and forth. A bounce usually occurs in one direction depending on how the paper is passing through the machine. This is usually accented by card stock (especially if it's over the machine's spec). 2. When a customer refuses a job for whatever reason. A printed document whose chief purpose is to convey information about a product, service, company, organization, concept, event or individual to a target group. An example would be the brochures available in state welcome centers and tourist areas. The most common type of brochure is printed on both sides and folded into thirds. Some brochures, such as maps may be quite large and contain complex folds. Brochures can also consist of multiple pages bound into a booklet using saddle stitching or some form of gluing. Most brochures are printed in process color (CMYK) on glossy paper. Small quantities of a brochure may be printed digitally with offset presses being used for larger quantities and better pricing. A boldface square, dot or other symbol, used before a sentence to emphasize its importance. An area of type which has been set in larger or bolder type from the body copy for added emphasis. This area may consist of a single word or a phrase. Copy that can be scanned or shot with a camera that reproduces a high quality copy of the original. Copy needs to smooth, clean and printed in a dark ink.. Forms with areas that are screened, have pantographs, areas of uneven ink or bleed through of the backer are not considered suitable candidates for camera ready copy. Also known as shootable copy. Due to advances in technology almost all camera copy is now scanned. Copy placed near a photo or illustration that describes or identifies the image or the items that the image contains. Carbonless paper is used as an alternative to paper with carbon interleaves. Carbonless paper starts out as bond grade paper. It is coated with either microencapsulated dye or resin and clay. 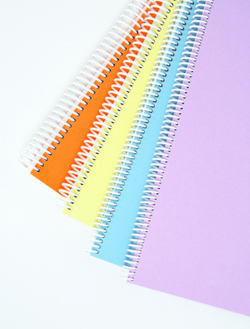 Paper designated as CB, or coated back, has been coated with a layer of micro encapsulated dye. Paper designated CF or coated front has a layer of clay and resin that react with the dye from the CB paper to form an image when pressure is applied. CFB paper, or coated front and back, has both coatings applied allowing for transfer to itself and to the coated front beneath it. Click Here for an extended article and links concerning carbonless paper. Books bound using hard board (case) covers. Typically known as a hardcover book. Coated back (CB) paper starts out as bond grade paper. It is coated with microencapsulated dye on the backside of the paper. This paper reacts to pressure, such as handwriting, by releasing dye from the microcapsules that react with the clay and resin on coated front (CF) paper to produce an image in the shape of the pressure applied. Click Here for an extended article and links concerning carbonless paper. Coated front (CF) paper starts out as bond grade paper. It is coated with resin and clay on the front side of the paper. This paper reacts with dye released by pressure from the coated back (CB) paper to produce an image in the shape of the pressure applied. 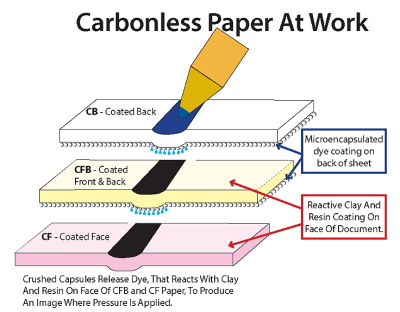 Click Here for an extended article and links concerning carbonless paper. Coated front and back (CFB) paper starts out as bond grade paper. It is coated with resin and clay on the front side of the paper. This paper reacts with dye released by pressure from the coated back (CB) paper to produce an image in the shape of the pressure applied. It is also coated with microencapsulated dye on the backside of the paper which releases dye from the microcapsules that react with the clay and resin on coated front (CF) paper to produce an image. In a multipart set with more than 2 sheets CFB comprises all the parts except for the face and back. Click Here for an extended article and links concerning carbonless paper. Paper coated with clay, white pigments and a binder. This yields characteristics that are better for printing because there is less picking and the ink stands out from the paper fiber instead of being absorbed by it. Various finishes can be achieved by this method varying from eggshell to glossy. Coil binding is composed of a plastic or metal coil that looks similar to a spring. the coil is feed through specially punched holes and then is cut to size and crimped to keep the coil from backing out of the holes. Coil binding provides a book that will lie open and flat and is useful for applications such as cookbooks and manuals..
Three pieces of equipment are required for coil binding. A punch is used to create the holes along the edge of the document. Then a coil inserter is used to thread the coil through the holes in the cover. Some shops choose to do this step by hand. Finally the end of the coil is cut to size and then must be crimped to prevent the coil from coming loose from the book. Crimping and trimming of the coil can be done with either crimping pliers or machines that have been specially developed for that function. For more information on carbonless business form books and spiral binding CLICK HERE. To gather sheets or signatures together in their correct order. (see Gather) This is of course accomplished on a machine called a collator or done by hand in some small shops. Machine used to assemble the various parts of a form into a finished product using glue or crimps. Typically, crash numbering is done on a collator. The process of preparing artwork for printing. It may include the assembly of characters into words, lines and paragraphs of text or body matter along with the placement of images for reproduction by printing. Also known as typesetting. Numbers printed in sequential order to allow the form to be controlled by the end user. e.g. 00001, 00002, 00003, etc. These numbers can either be printed by the press or crashed on the collator. A form which is manufactured from a continuous web and is not cut into individual forms prior to use. Continuous forms are available in 1 part bond and carbonless or carbon interleaved formats. Multi-part forms must be collated prior to use.Fanfold continuous forms are perforated between forms for removal of the individual forms. Some continuous forms are also produced in non-folded roll formats. Typically continuous forms have stubs on both sides of the form with lineholes, to allow them to be fed into an impact printer. Image made of non-discernable picture elements which give appearance of continuous spectrum of gray values or tones. Also known as a contone. All the text needed for a printing project.. It is usually marked up with instructions for the typesetter. Marks on a final printed sheet that indicate the trim lines or register indicators. See item "Crop" below. 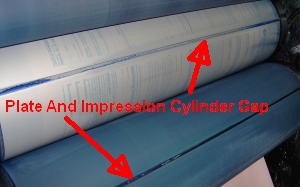 1) When the rubber blanket on a cylinder moves forward due to contact with the plate or paper. 2) Movement of print in a booklet due to the added thickness of folded sheets being behind one another in a folded signature. The outer edges of sheets creep away from the back most fold as more folded sheets are inserted inside the booklet. Creep varies based on the number and thickness of the pages in a signature. When significant creep occurs, it must be compensated for in the design process or during imposition. 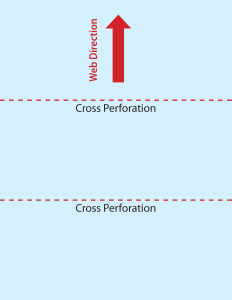 A perforation that is cut at a right angle to the direction that the web is running through the press. A term used in web press printing to describe the point at which a sheet of paper is cut from the roll; usually this dimension is equal to the circumference of the cylinder. For example a 17 inch press has a cut-off of 17 inches. The number of forms up is divided by the cut-off size to give the number of cuts needed to finish a job. A job consisting of 1000 forms that was printed 4 up would need 250 cut-offs or cuts, to complete the job. A shade of blue used in the four-color process; it reflects blue and green light and absorbs red. The rough or feathered edge of paper when left untrimmed. This edge is created during the paper making process where the pulp comes in contact with the deckle frame. A term that describes that portion of lower case letters which extends below the main body of the letter, as in the letter "p" or y.
Desensitizing ink can be used to simulate the effect of a pattern or spot carbon while utilizing carbonless paper. The ink must be applied with care to insure that other areas of the paper are not desensitized by excess ink. As a general rule, no more than 60% of the area of the offset press blanket should be coated with desensitizing ink. To gain a fuller understanding of how carbonless paper works visit our Forms Knowledge Base by Clicking Here. Words printed on a form, usually at the bottom, that provide instructions for the distribution of each section of the form. These words are also referred to as the "legend line". These words differ from marginal words in that they are usually printed in the base color of the document and are actually on the plate with the copy of the document. When a corner of a page is turned down. Can be a problem with certain printing processes. May also occur when you fold into a fold (such as a letter fold). At the side of one of the creases you get an indentation. It may look like a small inverted triangle. Darkening of halftone image due to ink absorption in paper causing halftone dots to enlarge. This results in a printed image looking darker that it should. Dot gain can be compensated for in the design process. A shadow image placed strategically behind an image to create the affect of the image lifting off the page. The above image was created in Indesign CS 6. Imposing items on a page in such a way that some of the items are cut from the paper parallel to the grain and others transverse or across the grain. This should only be done with items where paper grain is not important to the functionality of the finished piece. Dutch cutting is usually done to maximize yield from the sheet. To join a business form together with a thin glue line along the edge of the form. The most common position is "edge glue top". But typically any edge can be glued depending on the type of form. The form is separated by pulling the various plys apart. This type of form does not have a stub. To gain a clear understanding of the different types of business forms Click Here. Ink which was not designed to be on the printed piece. This may include drips, splatter, scratches and any other method that causes extra ink to be applied to an area unintentionally. Magnetic Ink: Any ink which does not consist of the printed E13B characters, which is located in the MICR clear band. This ink may cause the document to be either unreadable or to read incorrectly. The binding of carbonless forms together utilizing specially formulated glue which is actived only by the coated face (CF) or coated back (CB) of a document. Because the padding compound does not adhere to the uncoated surfaces of the document, the forms may be "fanned apart" into individual form sets when the glue is dry. The forms are usually produced using pre-collated carbonless sets. 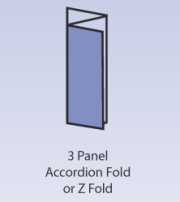 This type of padding is used in the production of either digital or sheet fed press produced carbonless forms. Only certain grades of carbonless paper are fan apart paddable. This process is analogous to edge gluing using a collator. A charge added to a print job that remains constant. This charge is not affected by the quantity ordered. Flat charges are usually a one time charge for extra work that must be performed outside of the usual workflow. Printing over the entire face of a page with color. Depending on the type of ink and results desired the flood coat may or may not be screened. 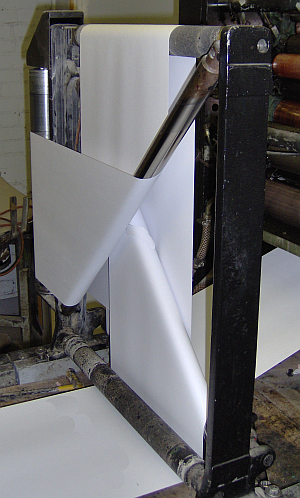 This process is most often used to change the color of white paper to another color. Typesetting that is aligned to the left hand side of the document margin. This results in what is known as "rag right "on the right hand side of the column of text. Typesetting that is aligned to the right hand side of the document margin. 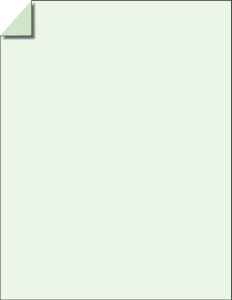 This results in what is known as "rag left "on the left hand side of the column of text. Offset lithography is based on the use of plates that have both oleophilic (oil loving) and hydrophilic (water loving) areas. The fountain solution is applied by the dampening system of the press to the plate allowing the hydrophilic area of the plate to repel ink. Fountain solution is a water based mixture that contains acid or bases depending on the desired pH, an organic or synthetic gum, a wetting agent such as alcohol or a alcohol substitute to reduce the surface tension of the water to make it flow more readily, fungicide to kill bacteria in the solution and some form of anti-foaming agent. A proper ink water balance is essential to quality printing. Paper that does not contain wood pulp impurities such as lignin but is composed primarily of cellulose fibers. Lignin is a complex polymer that partially comprises the secondary cell wall of plants. Lignin deteriorates over time and is undesirable in the production of quality paper. The imposition of multiple images of a job or jobs on a plate to get the optimum yield from the sheet of paper being printed on. Unprintable area created by the need to have an area to lock the plate onto the plate cylinder. Typically the gap on a press is around a 1/2". Gap may vary by manufacturer or even by a small amount on presses from the same manufacturer. The gap runs the entire length of a snap apart set. Gap is also referred to as lockup. When designing print items for web presses it is good to know what size gap needs to be allowed for in the design. This information should be available from your forms manufacturer. A strong, smooth, translucent, super calendared paper that has a neutral pH. It is considered to be food safe and provides protection from grease, air, moisture and water. It has been utilized for envelope windows, food packaging, philately envelopes, and hinges, firecracker packaging, and envelopes for the storage of various items such as entomologist field specimens. For more information, Click Here to be redirected to JBM Glassine a manufacturer of glassine envelopes. A printing process that uses a plate that is etched allowing the ink to flow into the groves before being transferred to the paper. This type of printing is also referred to as intaglio printing. The grippers of the printing press move the paper through the press by holding onto the leading edge of the sheet; this edge is the gripper edge. When designing items for print this is considered a non-printable area. Gripper area varies from press to press. Copy on which the top of the back copy is at the foot of the face copy. Also called tumble style. Copy on which the copy on the face and back are both at the top of the form. Repeating imperfections in printing caused by dirt, dried ink or other contamination on the plate or blanket. Usually a hickey has a dark center with a white halo around the contamination causing the hickey. Is a lossy file compession standard utilised to make large images smaller and easier to store and transmit digitally. JPEG's are smaller than files compressed with lossless compression. JPEG compression is best used to compress photographs and artwork. In printing, a high quality JPEG can be used for process printing for items such as brochures and calendar photos. JPEG"s cannot typically be used in jobs that require spot colors. JPEG's that came from a website are usually too low in quality to use for art in projects. JPEG stands for Joint Photographic Experts Group. A general rule of thumb for all graphics used in printing is that they need to be at least 300 dpi. Refers to the adjustment of space individual characters in a headline to give the appearance that they appear to be evenly spaced. Usually kerning is accomplished by by diminishing the space between certain characters. Paper that is processed with parallel lines to give the appearance of having been handmade. The lines simulate the screens that are used in the process of hand making paper. Smooth finish paper is called wove finish paper. 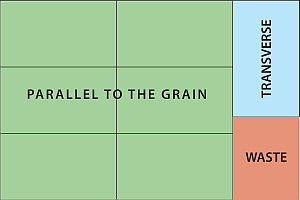 Space between lines of type; the distance in points between one baseline and the next. So called because in the days of letter press printing, thin lead spacers of varying point sizes were used to provide space between the lines of cast type. The addition of space between typeset letters to achieve the purpose of filling a specific area. Unprintable area created by the need to have an area to lock the plate onto the plate cylinder. Typically the lock up on a press is around a 1/2". Lock up may vary by manufacturer or even by a small amount on presses from the same manufacturer. The lock up runs the entire length of a snap apart set. Lockup is also referred to as gap. When designing print items for web presses it is good to know what size lock up needs to be allowed for in the design. This information should be available from your forms manufacturer. See the photo at entry for "Gap". A personalized type or design symbol for a company or product. It uses consistent type to project an image of the company in all written forms of communication. To make copies of. Specifically, as referring to the copies made using carbon or carbonless paper when writing upon it. This is why business forms are sometimes referred to as manifold business forms. Refers to the space left from the edge of the text to the edge of the page. 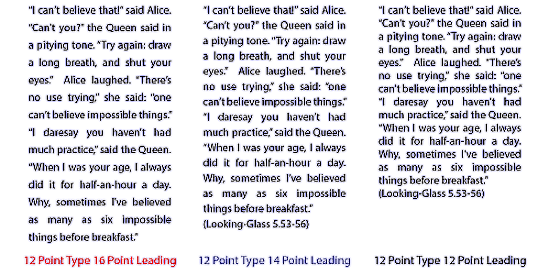 Typically margin is allowed on all four sides of a printed text piece. 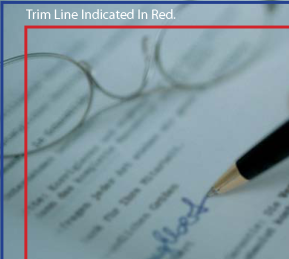 Words usually printed in red ink at the top or bottom of a form that allow each portion of the form to be routed to the correct recipient. A coated paper finish that goes through minimal calendaring. The surface of the paper appears uniformly smooth and is without luster or glare. Reference, calendaring. Acronym for "Magnetic Ink Character Recognition. MICR ink usually contains magnetized particles of iron oxide and is printed with a special character set (E13B) that renders them machine readable. This allows for the machine fast and reliable processing of checks and other documents to return them to the issuing institution. It contains the numbers 1-9 and the following symbols, transit, amount, On-Us, and dash. A 5/8" band parallel to the bottom edge of a MICR document in which no extraneous MICR ink can occur. No Carbon Required. Paper that was developed as an alternative to using carbon sheets between parts of business forms to transfer the image from part to part. See also CB, CF, and CFB definitions.. Indirect printing method, introduced in 1905, in which the inked image on the press-plate is first printed onto a rubber blanket, then in turn offsets the inked impression on to the sheet of paper. This type of printing is based on the concept that oil and water do not mix. Thin aluminum plates are used which have a hydrophilic (water attracting) surface and an oliophilic (oil attracting) area that the ink adheres to. Rollers reapply water and ink on each rotation of the press cylinder allowing for a continuous web to be printed by the press or many sheets on after another. Offset lithography is the predominant form of printing used today. Problem that occurs when ink application is too high and the wet image transfers to the back of the next page or the back of the web when it is rolled up. Offsetting is avoided by judicious setting of water and ink balance making sure that only enough ink is laid down to provide dense coverage but still has time to absorb into the paper and to dry. The application of a special glue to bind forms together into sets. This glue, when dry, allows a single set or single form to be removed while the other forms remain bound together. The orderly arrangement of pages in a book so that they are in the correct order when printed and bound. This is usually accomplished through the process of imposition. Background printing on a document that contains a pattern or flat screen. The pantograph is usually printed in a light or screened ink, and is either decorative in nature or provides an antialteration feature for the document. Pantographs can be branded using a company or organizational logo as the repeating background pattern. Custom made carbon paper which has carbon only in a specified area. This allows for the transfer of an image on a business form in only the specific area that has carbon applied to the paper. Unless a print shop is able to make their own spot carbon, this causes longer lead times to the form production process. The carbon must be ordered, manufactured by a carbon paper manufacturer and then shipped to the plant to be interleaved with the business form. 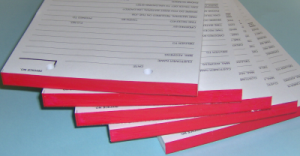 In some applications, desensitizing ink applied to carbonless business forms paper (NCR) can provide some of the same functionality. Typically desensitizing ink can be applied to an area of not greater than 60% of the area of the blanket being used to print the form. Forms are usually quoted by the "M". This is Roman numeral for 1000. A file format developed as a general replacement, on the web, for the GIF format due in part to legal issues relating to the LZW compression alogrithim and the limitations of the GIF format. The PNG file is superior the the GIF in a number of ways. First, it allows for loseless compression while maintaining a small file size. Secondly, it supports indexed color both in grayscale and RGB. Third, with its alpha channel, it is able to have various levels of opacity, allowing for varying degrees of transparency. The PNG does not support multiple images in the same file so animation is not supported. PNG stands for Portable Network Graphic. PNG's can be utilized in the printing process for some applications. A general rule of thumb for all graphics used in printing is that they need to be at least 300 dpi. Typesetting term referring to the measurement of a typeface from the ascender line to the descender line. Even though type may be the same point size it may still vary greatly in size when compared to another typeface of the same point size. See example above. A quote pulled from the text and emphasized by displaying it in a larger or different type than the main body of the text. 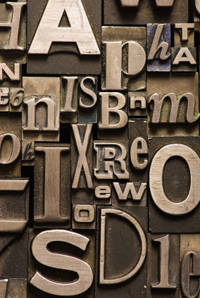 The goal of typesetting is to produce copy that is easy to be read on the finished page. Type size, columns, leading, the color of the type and the color of the page all play a part in a design that has ease of readability. Type that is set in white with against a darker background. The best practice is to set the type in a bold sans serif font . Fonts with fine serifs such as Time, Times Roman, Minion, etc., should be avoided as their serif areas easily fill with ink and lead to an obscuring or closing up of the text. A web press printing process where the roll of paper is printed and stored on a roll to be shipped or sent to a collator for further processing. The collator can be used to bind the various parts into forms, if using carbonless paper or add carbon or crash numbering to the the forms. Scumming happens because the plate begins to take up ink on the non image area of the plate. It is most often caused by poor water ink balance. A booklet which has a cover made out of the same type of paper stock as the internal pages. Copy that can be scanned or shot with a camera that reproduces a high quality copy of the original. Copy needs to smooth, clean and printed in a dark ink.. Forms with areas that are screened, have pantographs, areas of uneven ink or bleed through of the backer are not considered suitable candidates for shootable copy. Also called camera ready copy. Coil binding is composed of a plastic or metal coil that looks similar to a spring. the coil is feed through specially punched holes and then is cut to size and crimped to keep the coil from backing out of the holes. Coil binding provides a book that will lie open and flat and is useful for many applications. For more information on business form books and spiral binding CLICK HERE. Varnish applied to an area to highlight it from the rest of the printed piece. For example spot varnish could be applied to water drops on a printed piece to make them look wet. The effect can be applied to any area that you would like to “pop out” on the printed piece. Color model based on the subtracting (absorption) of certain wavelengths of light and the reflection of others to produce various colors. Colors seen are based on what colors of the spectrum are reflected by the surface of an object and is made visible. 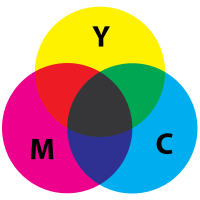 The basic components of this color model are Cyan, Magenta, and Yellow. In printing this is the CMY of process color printing. 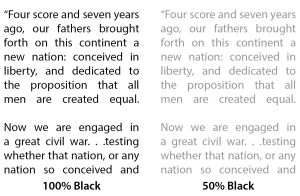 True black cannot be made in this model so K or Black is added to complete the spectrum. The gamut of color reproduction is limited to around 20% of visible colors. Paper that is 11" x 17". Copy on which the top of the back copy is at the foot of the face copy. Also called head to foot. All the variations of a font including bold, italic, normal, light, condensed, etc. Abbreviated form of the words "typographical error". This refers to errors made in the typesetting or processing of a printed document. The goal of proofing is to detect and correct such errors.. The procedure of cleaning a particular ink from all of the printing elements (rollers, plate, ink fountain etc.) of a press. On presses using Pantone or spot colors the addition of a color necessitates a washup charge being added to a quote. A widow occurs when the last line of text is less than half the length of the column width.